Pinay Mom Adventures: Ready to Read at 3 y.o. 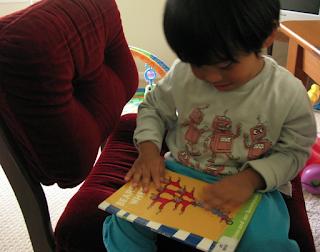 Ready to Read at 3 y.o. was happy to oblige. Can you see me grinning from ear to ear!?! and ideas to discover. Here we come world! Hi there! saw your post while researching toddler activities. I love this post about teaching them to read! Thanks for just telling it how it is. My son is under 3 and he's in the middle of learning his alphabet. I can't wait for the day he can actually start spelling something out! Thanks for your insight! Enjoy your learning moments with your son :) Before you know it, he'll know his ABCs and will be reading on his own. How time flies!